ItemLF.00755 - Pier 'D' fire, 2:42 p.m. Photograph depicts US cable ship "Restorer" at the First Narrows. 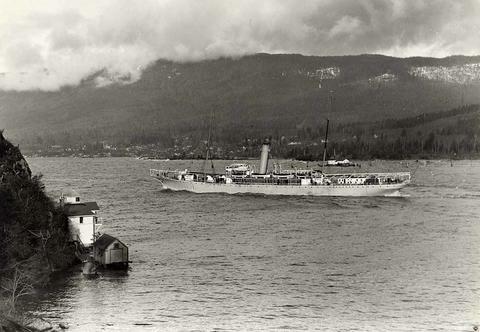 Ship with one smokestack in middle of image; small shack and house built directly on water in bottom left of image, backing up against hill side, probably underneath Prospect Point; North Shore mountains in background.